All break the sweetie man and I have been rehearsing this new Friday feature that will be links I collect during the week, then he puts together all the thumbnails and I post them at the end of the week. 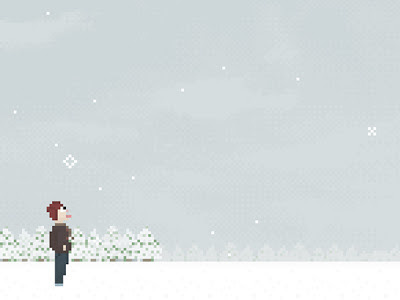 This is far and away my favorite from the entire month so far, so it gets its own feature; it's a music generator that makes notes when you catch snowflakes with your tongue. It has a lot of commands but basically left and right arrows to chase the snowflakes around, up arrow to look up and stick your tongue out, and down arrow to put your head back down. Though I just chased the snowflakes with my tongue out. Then I got tired of moving my little guy around and wanted him to walk around by himself. Which is ultimate first world problem, but then Chuck said to just leave him standing and let the snowflakes fall on him. Which is genius and what a great life metaphor for sometimes. I just leave it on in the background, it's really pretty just like that and perfect for the season. Things are good? I get SAD this time of year, but this is the best year yet. I realized that depression for me isn't feeling sad, it's feeling stopped. I feel basically happy, thank god. I just can't make myself do stuff like get out of bed. Knowing that I "should" get out of bed has lost its power over me, it takes a really happymaking thought to get me up. Though I am nothing if not easily amused, I should make a list. Wait until you see my new tights, ahhh!